Mount Kilimanjaro is a large, dormant volcano situated near the Kenya border in Northern Tanzania, within the Kilimanjaro National Park. Both the largest free-standing mountain in the world and the highest mountain in Africa, Mount Kilimanjaro is especially unique due to its snow-capped peak which imposes itself in the midst of the flat, extensive plains of the Tanzanian Savannah. Towering over Africa with a height of 5,894 metres, Kilimanjaro is located in northeastern Tanzania. Eternally snow-capped, this grand mountain is formed by three extinct volcanoes Kibo, Mawenzi, and Shira. Its mass and height have a major effect on the climate of the surrounding area, and the wildlife and vegetation therein. 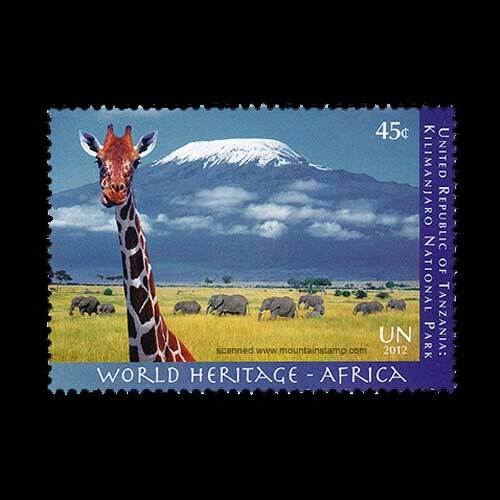 In 2012, United Nation from its New York headquarters issued a postage stamp featuring beautiful Mount Kilimanjaro.